This protocol works well to visualize many of the spectrosome-fusome and ring canal components of both the germarium and vitellarium. Cytoskeletal elements like the actin network are well preserved, but spindles in the germarium and microtubule networks are not. 1. 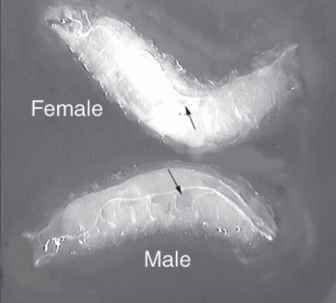 For each staining, dissect out with fine-tipped forceps 5-10 pairs of ovaries and place into 1 mL of Drosophila Schneider's medium kept in a small Petri dish. Leave the very end of the abdomen attached to ovaries to make them more visible during the immunostaining procedure, but try to remove as much fat body tissue as possible (see Notes 1-3 and 23). 2. Transfer the dissected ovaries into a microcentrifuge tube with 1 mL of Schneider's medium and incubate them for 5 min (see Note 4). 3. Retain the ovaries in approx 50 ||L of Schneider's medium by removing the rest of the solution with a long-pulled glass Pasteur pipet. 4. Add 1 mL of PBS to the ovaries and wash them for 10 min by placing the tubes on a rotating wheel. 5. After washing, remove the PBS solution with a long-pulled glass Pasteur pipet and leave approx 50 |L of solution on the ovaries. 6. To carry out the fixation, add 1 mL of buffer B fixative to the microcentrifuge tube (see Note 5). 7. Shake the microcentrifuge tube gently by hand for 10-20 min (see Note 24). 8. Remove all the fixative with the same long-pulled glass Pasteur pipet used in step 5. 9. Add 1 mL of penta-PBT to the ovaries and incubate them for 30 min on a rotating wheel (see Note 25). 10. Remove all penta-PBT with the long-pulled glass Pasteur pipet already used in steps 5 and 8. 11. Immediately add 1 mL of PBT to the ovaries and incubate them for 30 min on the rotating wheel. 12. After this incubation, retain the ovaries in approx 50 |L of PBT. 13. Carry out the blocking by adding 900 |L of PBT and 50 |L of FCS (stock solution) into the microcentrifuge tube. Put the microcentrifuge tube on the rotating wheel and rotate at low speed for 30 min at room temperature (see Notes 7 and 8). 14. Follow Subheading 3.1. from step 13.